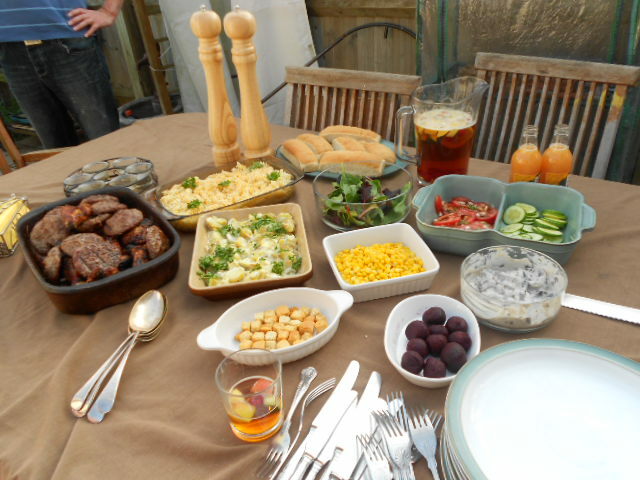 With this sudden onset of wonderfully sunny weather the planned roast was ditched in favour of a BBQ and I guess like me, many of you will have done the same. I am not a great lover of BBQs because even though it seems a great idea at the time: the men of the house all stood round the barbie cooking up some grub. In reality there is a lot of behind the scenes preparation that still has to go on. Here I have just done some very basic side dishes that will be eaten by the children as well as the adults. As it was just family we bought in some meat rather than marinade my own and kept it simple. 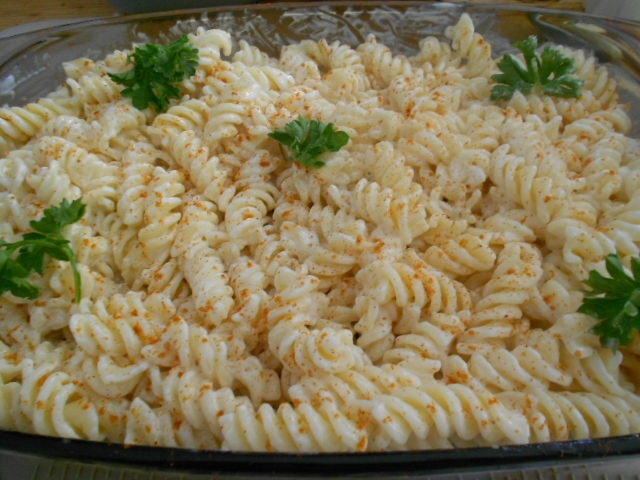 Pasta Salad – this is one my son loves and will make up for himself as just a snack. Cook the pasta according to packet, taking of the heat before it is fully cooked – then rinse it and leave it in cold water to cool (the water stops it from sticking together). Add the pasta and mix well. Decorate with the paprika (just a sprinkling) and parsley. Boil the potatoes until soft and then drain them and stand in cold water. Chop the onions finely . Cut the potatoes roughly and sprinkle over the onions in the serving dish. 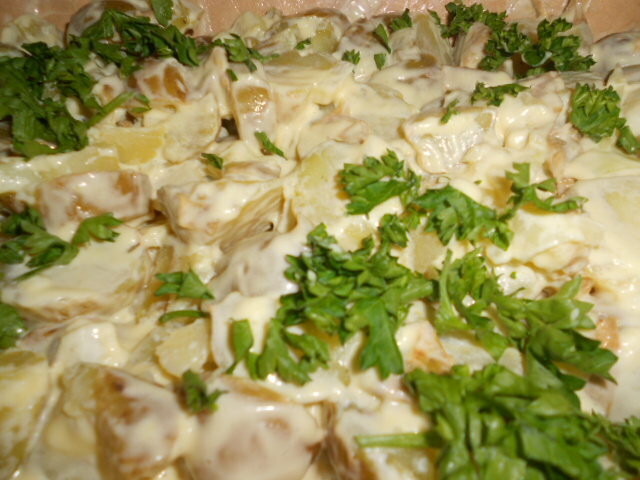 Add a good dollop of salad cream and mix well with a knife to chop the potatoes a little more. 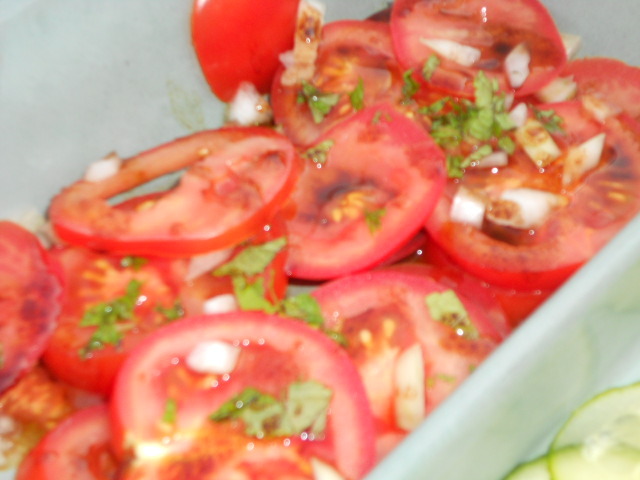 Cut the tomatoes, chop onions finely (I don’t use a whole onion here but may use two small salad onions). As you take to table add the dressing. Garlic Mushrooms – my son had added mushrooms into the shopping basket in the hopes of a barbie. Add the mushrooms and cook until soggy. 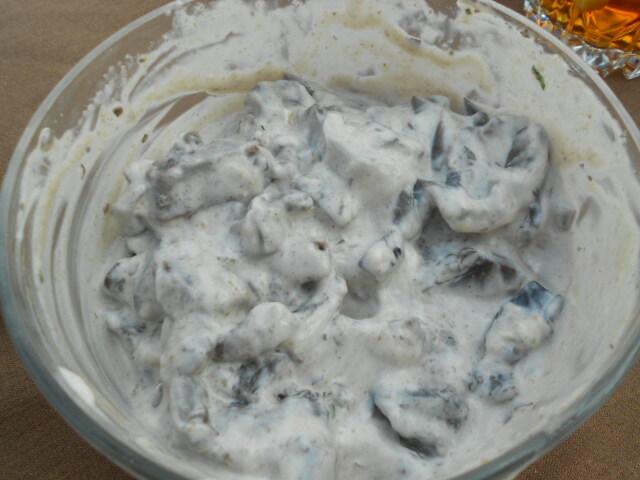 Just before serving mix mayonaise with garlic, add the mushrooms and mix well. There are so many variations on these dishes. I change the curry powder for garlic. You could add tomatoes, peas, sweetcorn to the pasta. See what this inspires you to try and let me know. Please add your comments and let me know what works for you.